Journaling scrapbooking stickers so much fun to use. In this layout I show you how to use them to quickly add style, and most importantly, your story to your page. This layout was created using Daisy Ds Sage Gingham paper, Sage Bazzill cardstock, My Minds Eye Bluebird At The Beach Medallion/Brown paper, Hot Off The Press Blue Swirl paper, Green Stripe paper, green cardstock, sage green ink, brown ink, a black pen, NRN Designs Life Titles stickers and Daisy Ds Journaling Hearts stickers. 1. Use the Daisy Ds Sage Gingham paper as your background. Ink the edges with sage ink and set aside to dry. 2. Cut a strip of Sage Bazzill cardstock approximately 15cm wide. Ink the edges with brown ink and when dry, adhere vertically to the page about 2cm from the left edge. 3. Cut a piece of My Minds Eye Bluebird At The Beach Medallion/Brown paper measuring approximately 9cm by 27cm. Ink the edges with brown ink and when dry, adhere vertically to the page about 3cm from the left edge and 2cm from the top edge. 4. Cut a piece of Hot Off The Press Blue Swirl paper measuring approximately 21cm by 20cm. Ink the edges with brown ink and when dry, adhere to the page about 2cm from the right edge and 6.5cm from the top edge. 5. Cut a piece of Green Stripe paper measuring approximately 26cm by 4.5cm. Ink the edges with brown ink and when dry, adhere horizontally to the page about 4cm from the bottom edge and up against the right edge. 6. Mat your photo with green cardstock. Adhere approximately 6.5cm from the left edge and 8cm from the bottom edge. 7. 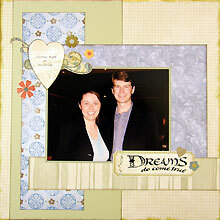 Place the rectangular journaling sticker so that it overlaps the bottom right corner of your photo. Use a NRN Designs Life Titles sticker to add your title to the sticker and embellish with a small heart and flower stickers from Daisy Ds Journaling Hearts stickers. 8. Using a black pen, add your journaling to a heart journaling sticker. Please it on your page so that it overlaps the top left corner of your photo. 9. Finally, place three flower stickers around the heart journaling sticker, as shown in the layout above.